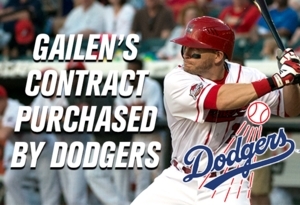 (Lancaster, Pa., June 26, 2017) - The Los Angeles Dodgers have purchased the contract of Lancaster Barnstormers outfielder Blake Gailen, it was announced today. He has been assigned to Class AA Tulsa and will join LA’s Texas League affiliate later in the week. Gailen, 32, becomes the fourth player to leave the Barnstormers for a Major League organization this season, joining Jeff Kobernus (Seattle), Elih Villanueva (Boston) and Darian Sandford (Washington). He was batting .323 with eight homers and 30 RBI at the time of his departure. The lefty batter had accumulated 14 doubles, walked 29 times and stole nine bases over the course of the season. This marks the third time that Gailen has left the Barnstormers to join a big league farm system. The 2012 Atlantic League Player of the Year finished the 2013 season with Buffalo (Toronto) and went to Arkansas (Angels) in 2015. He leaves as the Barnstormers all-time career leader in hits (524), runs (309), homers (72) and doubles (108). With a three-run homer at York on Sunday, he tied Jutt Hileman’s career RBI lead with 273.